Fans of Lord of the Rings have it good. Not only were the books brought to life in vibrant and rich detail on screen, but fans willing to spend the best part of a day on a plane can actually visit Middle Earth. New Zealand, save for the harsh, volcanic wasteland, was practically cut and pasted from the pages of the books. Fans of the Song of Ice and Fire don't have it quite as lucky. While the series has succeeded in breathing a third dimension into the sprawling, almost debilitating level of detail the books provide, obsessive fans lack the physcal filming locations that would let them feel like they are actually in Westeros. Unless you want to travel to a nordic hellscape, or a Hollywood backlot. But that lacks the same magic. For me anyway, maybe it works for you. But that's a little weird. 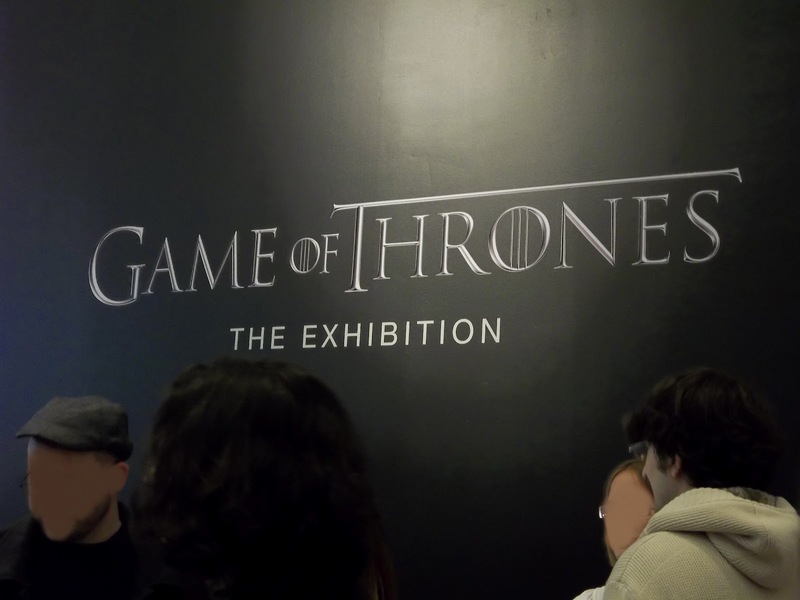 Running through to the18th of March in Toronto, Ontario is Game of Thrones: The Exhibition. This collection of props, videos, photos and costumes from the HBO series is meant to generate interest in the coming second season, which is only 18 days away, as of this writing, and to give fans a little touch of Westeros, even if it is a sterile, restrictive, asylum-like feel. What will follow, after the break, will be a detailed break down of all the objects within the exhibition. 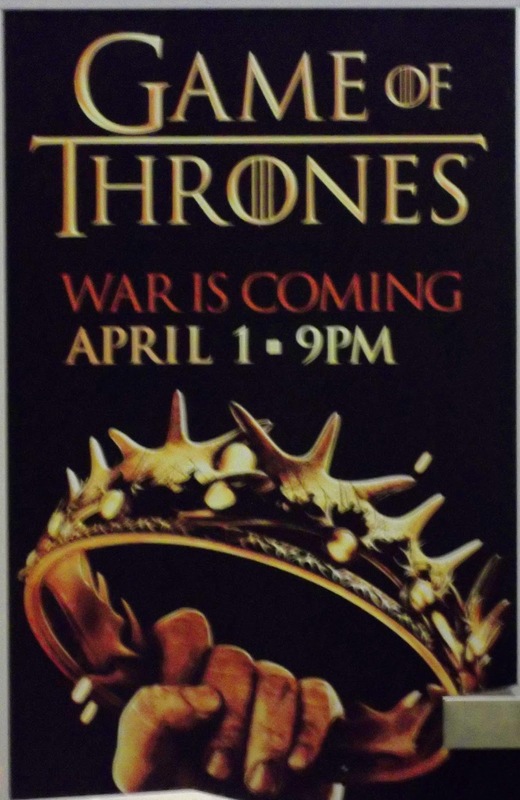 Spoilers will be unavoidable, so if you haven't read the first novel, or seen the first season, be forewarned. Unfortunately, photography was not allowed in the exhibit. For illustrative purposes, publicity photos from the series have been included along with descriptions of said objects. All photos, except the two appearing on the main page, and the final photo on the piece, which were taken by me, are the property and Copyright © HBO. To read the detailed description of the exhibition, hit the jump. Upon entering, the coat of arms of Houses Stark, Targaryen, Lannister, Baratheon and Greyjoy decorate the wall, along with the long banners of the Starks, Lannister, Baratheon and Joffery's half and half banner, combining the Stag and Lion sigils. These banners were those that would be hanging from castle walls, or carried by banner men. What immediately struck me was how unpolished these, and everything else in the exhibit appeared. They looked like the sort of thing you'd see in a museum rather than a television show PR campaign. Tattered and falling apart, it leant an air of authenticity to everything. Two maps, one of the Kings' Landings, and one of the entirety of Westeros, started the exhibit properly. There were no labels on anything, making the assumption that anyone coming to the exhibit would know what they were looking at. I assumed these are war maps, perhaps from the councils Robb held at the end of the season. Wolf and lion shaped figures, like chess pieces, were holding the maps down. 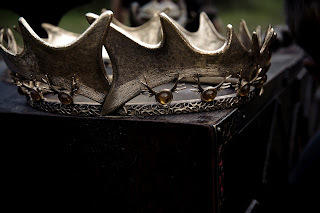 The first major prop featured was the Hand of the King brooch, worn by Lord Stark (Sean Bean) in the first season, and soon to be worn by Tyrion Lannister (Emmy winner Peter Dinklage). Readers of the books know that this medallion was a creation of the show, the books featuring a necklace of golden interlocked hands. The change will result in a loss of irony during a critical moment in later seasons, but as a visual, the broach is quite lovely. It was what I most anticipated seeing, and despite being a small piece of jewelry, was the highlight of the exhibit for me. 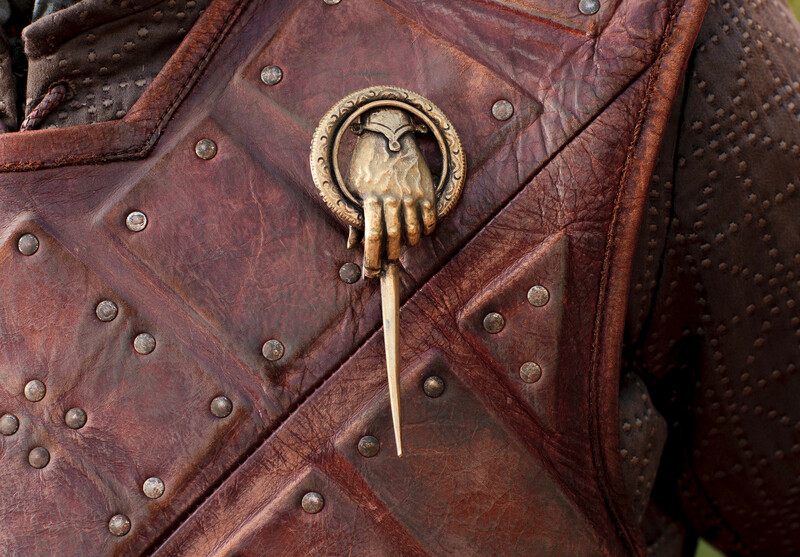 Rather morbidly, mounted on the wall beside the Hand was the Ned Stark prop head, which was seen mounted on Joffery's castle wall in the last episode of season one. Not entirely life like, but seeing the dead, lifeless eyes of fake Sean Bean starring out at an audience of fans was suitably creepy. One of six costumes on display, Jon Snow (Kit Harington)'s Night Watch cloak and boots were accompanied with a production video describing the process of designing and creating the costumes. Most of the videos that were shown have been released online over the past few months. The best detail on the Black was the staining on the boots and fur with salt residue, making them look worn and old, giving the impression that Jon was the not the first to wear these. Wonderfully, it was heavily layered and looked like it would keep you warm during those cold nights on the tundra, but also had a knight-like design quality. Perfect for protectors of the entire kingdom. Queen Cersei (Lena Headey)'s robes were next. It was a simply designed gown, but still elegant. This was, I believe, one of her private gowns, and thus lacked the extravagance of a formal gown. Made of lighter materials, with richer, sharper colours that the other costumes, as would befit the Queen. Perhaps the most surprising thing about it was revealing how small Lena Headey is. Hidden in the corner (and missed by me on the first walkthrough) were the Dothraki costume worn by Daenerys Targaryen (Emilia Clarke) and one dragon's egg. ﻿I noticed first on this costume, and later on nearly every costume, is that the sigil of the house is almost always featured somewhere, usually as a brooch. Danys is on her left breast, as can be seen in the picture above. Only Jon and Cersei lacks sigils. In Jon's case, it makes sense. Jon's entire costume is the sigil of the Night's Watch. 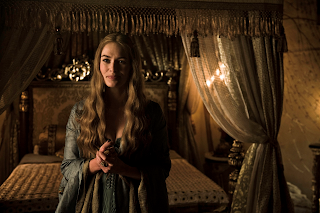 Looking the entire costume over, I couldn't find any sign of a lion (much more likely) or a stag anywhere on Cersei. A statement, perhaps, that she is loyal only to herself. The egg was fantastic. About the size of an ostrich egg, up close, it was textured like lizard scale to the tiniest detail. The beige one was featured, which was slightly disappointing. I was hoping for the green, as I (for whatever reason) assumed it would have a shimmer to it. As the beige one appeared, it was given the look of being sand blasted, again, more like you'd expect to see in a dinosaur exhibit at the Natural History Museum. A large projection screen showed more production videos, split up by repeating the most recent trailer for season 2. The most interesting of these videos was the Day in the Life of an Extra, which touched on all aspects of production. As viewers assembled to watch these videos, you were very aware that you were also standing beside a stuffed crow, presumably one of the props from Maester Aemon's tower. Some production pictures covered the nearest wall, giving away movie magic secrets, like the sky cells of the Eyrie were about three foot off the ground in a parking lot. Some magic lost, some magic found, I guess. 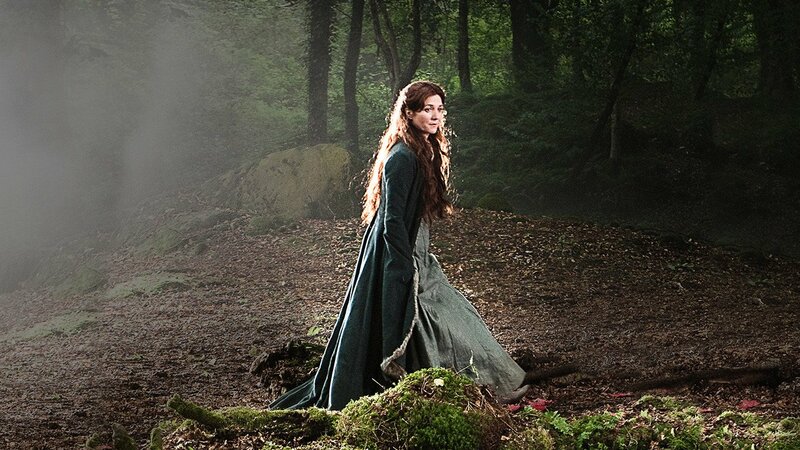 Compared to Cersei's gown, the costume seen being worn by Catelyn Stark (Michelle Fairley) in the first episode of season one, was practically a peasants outfit. A thicker material, probably cotton, and in very Earthen tones, it was the least pretentious of the costumes featured, even for the Lady of the North. She wears a Tully fish strung through a buttonhole midway down the gown. On the show, I loved the contrast between her fire red hair and the muted clothes she wore. I have to think that was deliberate. From here, the exhibit shifted its focus on what was coming in season two. Since, as we've been told repeatedly, war is coming, we get a glimpse of the tools of war. Some ornate glassware was first up. I couldn't place it, though my suspicion is that it was from Kings' Landing. Robert's horn cup was also displayed, and did little to change my thoughts that it would be a terrible thing to drink out of. Renly's gloves, dagger, and long sword were displayed here, the hilt of the long sword having a stag carved into it. The highlights of this section though were two 'iron' shields, imprinted with the Stark dire wolf. Even being plastic props, they looked like they’d be heavy to lug around, and certainly were the more detailed of the war props. It’s a damned shame this show isn’t being marketed towards children (what, children love whores. Don’t they? I’m being told they don’t, ok), because these shields would make great toys. One of them on your arm, that foam Thor’s Hammer in the other. Facing off against Batman holding a lightsaber. You know what, screw the kids, I want a Stark shield. Get on that, internet. 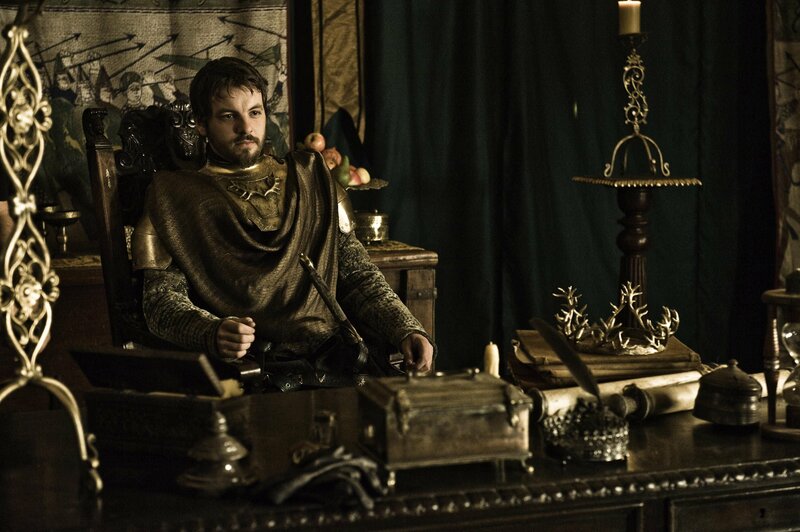 Renly (Gethin Anthony)'s King's armour, and a video along with it, came close to the end. The antlers of his House were imprinted on his armour, which was colourful and draped in various layers of fabric, and had a factory fresh shine to it, obviously deliberate, as Renly’s a lover, not a fighter. The video explained, without actually saying, that because Renly is more than a little feminine, his armour was designed more like that of a woman. On screen, this should make for good contrast with Brienne of Tarth, who has been constructed from the masculine perspective. The last costume on display was that of Melisandre. As befits a priest, her costume lacked anything but the bare essentials. As a priestess of the Fire God, everything was done in some shade of red. A necklace worn with the costume displayed a flaming heart with the chain emulating the flames, as it surrounds the neck. 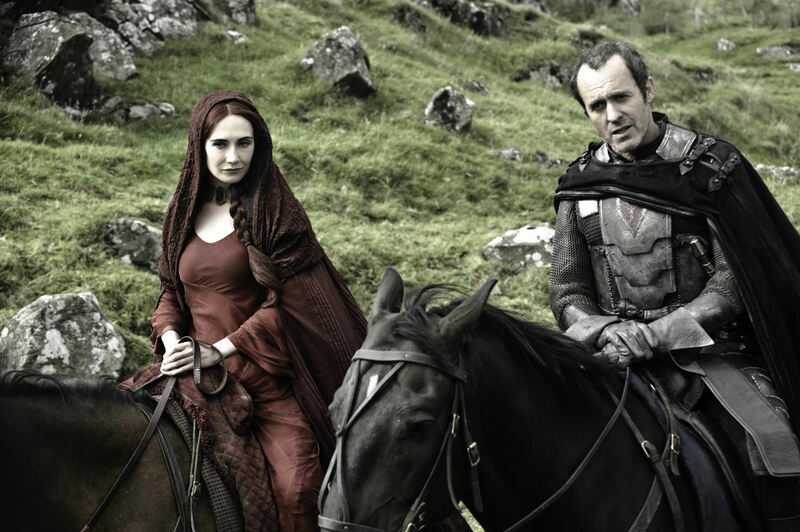 For whatever reason, in the books, I always imagined Melisandre having multiple layers of robes, like a flickering flame, but this version of the costume has went with a simple cloak over the tight fitting dress. A personal aside, in the later books, much like Jamie, Melisandre became one of my favourite characters, and I am more interested in seeing how the show adapts her than any other character being introduced this season, and that is not a short list. 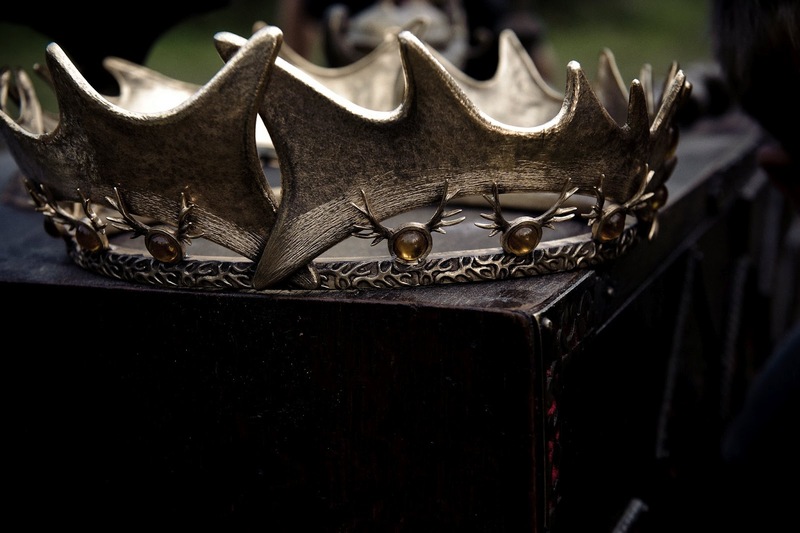 The final piece inside the exhibition was the reason for the coming war: King Robert's crown, fashioned after the antlers of the stag. Compared to this, Renly's twiggy antler crown seems juvenile, but that’s probably the point. The crown was impressive, let down only by the cheapness of the amber 'jewels' inlayed. Certainly looks better on screen than in person. As you exit, Stannis' banner, adopted after his conversion to the new religion, shows a flaming heart and a stag. 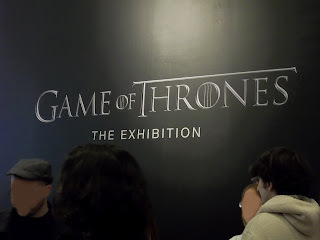 Under the banner read "war is coming", at which point you left Westeros behind and joined the line for the main draw of the exhibit, and the motivation for the entire series. The wait to sit in the Iron Throne took as long as seeing the entirety of the rest of the exhibit. Personal photographs were welcome, but HBO was there to take four poses of everyone who wanted to sit. Even though it was made of plastic, the throne was still horribly uncomfortable to sit in. Which was a nice attention to detail, I thought. I recommend heading over to Facebook and checking out all the pictures, uploaded there. Some people were really getting into it, though the number of people, men and women, which opted for the most suggestive poses was a little worrisome, and must speak volumes about our modern society. Or, sitting in a giant chair made from thousands of melted down swords makes people a little extraverted. Some even came in costume. I opted for my continuing trend, having pictures taken next to geeky things, in my hat. It's a very nice hat. In the end, it was a very short exhibit. Two runs through took about half an hour. It was free however, and I got to see many remarkable things that otherwise I wouldn't have. Was it successful? Yes. Was it enjoyable? Yes. Would I have liked to have seen more? Certainly. 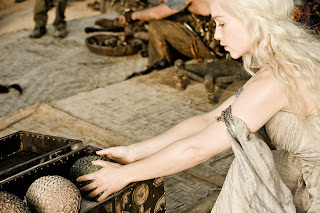 Was it stupid of them to hide the dragon egg in the corner, behind a wall, beside a projection screen where I'm guessing most people simply walked right pasted it, failing to realize that they had missed it until they were on their way home, resort into cursing at the sky for their lost opportunity? Damn straight. What it was, more than anything else, was a celebration of the time and effort the behind the scenes people put into the show. We love the show from the acting, for the story, and the visuals, and tend to forget that each costume has to be sewn, that every prop has to be designed and rendered, and that everybody involved takes their jobs as seriously as the actors reciting the lines. The people who work on Game of Thrones clearly love the world of Westeros, and because of them, it feels real. I, for one, will watch the new season with a deeper appreciation for what goes into creating this series, and will savior every little detail they choose to show us, and assume that for every detail we notice, there are a hundred hiding in the background, that we’ll never know, but that someone, somewhere, is very proud of. Now, bring on April already. 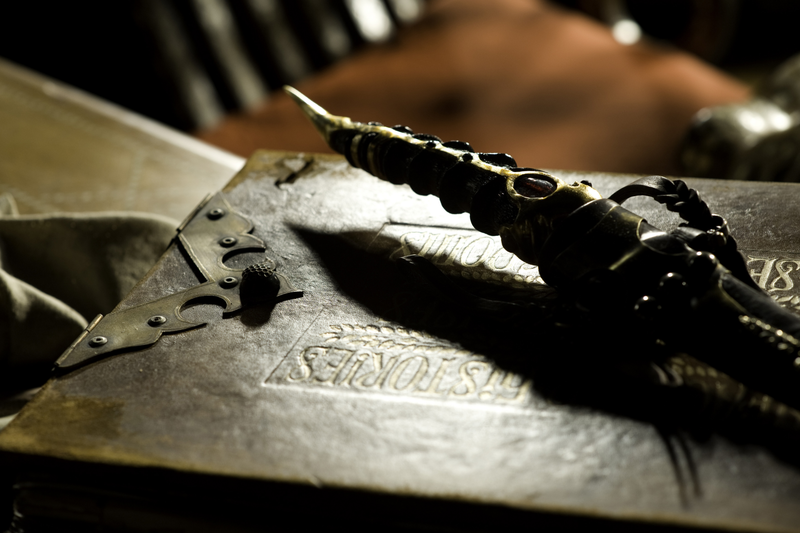 Photos via Westeros, the leading Song of Ice and Fire resource on the net.